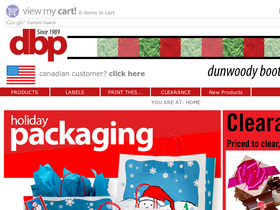 Dunwoody Booth Packaging, online at DunwoodyBooth.com, is a premier supplier of earth-friendly packaging and labels. Their goal is to supply responsible packaging, which means their products are either carbon neutralized, made from treeless paper, or are 80-90% recycled. Save on your green packaging purchase today from DunwoodyBooth.com by visiting 58coupons.com for Dunwoody Booth Packaging coupons,Dunwoody Booth Packaging promotions and Dunwoody Booth Packaging savings. Sign up for the Preferred Program at DunwoodyBooth.com to save 5% on all orders of $100 or more. Click link to get started. Shop the Specials and Clearance section at DunwoodyBooth.com to save up to 60%. Click the link to go straight there. Hurry and save 20% on Multi Color Ink-Printed Labels at DunwoodyBoothPackagign.com. Click link and use the coupon. Right now you can save 10% at DunwoodyBoothPackaging.com on Custom Ink Printed Labels. Use the code at checkout. When you spend $100 or more at DunwoodyBooth.com they will reward you with a free gift. Click link to see what treat is in store for you. As a registered charity you can save 15% at DunwoodyBooth.com. Click link for more information. Act now to save 20% from Dunwoody on Custom Foil Stamp Printed labels. Use code at checkout. At DunwoodyBooth.com their Green Deal is 20% off on Anniversary labels. Click link to shop and use the code.